Easily navigate between email, SMS, and Push with just a click. Your available channels are highlighted, while channels that haven't been activated are gray. Interested in learning more about SMS or Push? Contact your Account Manager for more information. The secondary menu accesses content within each channel; email lists, SMS short codes, and push apps. 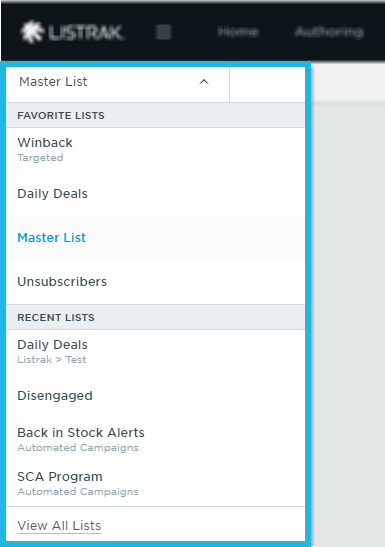 Within the email channel, save your favorite lists and move between your most recent lists. If you can't find the list you're looking for, select View All Lists. Easily select lists on pages where applicable, such as when creating a message. Learn more about how to personalize the email list select drop-down menu here.